Want to go hiking or camping but lacking a few essentials? Grab a bargain with ex-hire, used camping gear for sale and as-new or used bushwalking clothing. Our rental camping equipment was top-notch but we no longer offer this service so don't need the gear anymore. We also have a bunch of ex-uniforms for sale from guiding walking tours. Those days are over too (don't worry, we now tell you how to do it yourself). 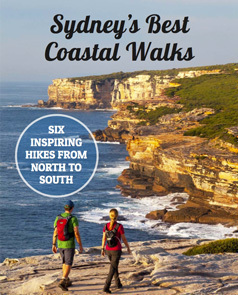 We believe in quality gear, so all our male and female guides were kitted out in Macpac, with an added Sydney Coast Walks logo. Once upon a time we were known as Royal Coast Walks, so there are some RCW logos too. Most of the clothing is “as-new”, or even “brand-new-with-tags” because we bought uniforms in bulk without knowing future guide's sizes. Many items have never been worn. There's not much left so we're selling it on eBay instead of in our usual online shop, because – unlike our range of walking maps and guidebooks – once this stuff is gone, it's gone. It goes without saying that gear and clothing is sold, “as is”. That means there may be minor thread pulls in tent mesh, or some colour fading of sun hats – check each item description for more details. Be quick because this ex-hire, used camping gear for sale won’t last much longer.